Scarlet Terre is a private residence designed by L’EAU DESIGN Co. Ltd. 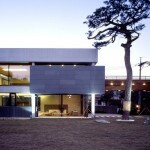 This house, located in the residential area of Seongbuk-dong to the north of the old fortress at the edge of Mt. Bukak, looks over Seoul as if gazing straight at the downtown district. This entry was posted in bathroom, bedroom, house, kitchen, living, outdoor and tagged bathroom, bedroom, contemporary house, house idea, houseidea, kitchen, L'EAU DESIGN Co., living, Ltd, outdoor, Scarlet Terre on March 24, 2015 by admin.